England have named Paul Gustard as their new defence coach. 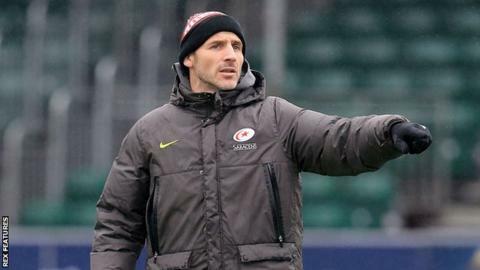 The 39-year-old will leave his role as Saracens forwards and defence coach in the new year to join new England boss Eddie Jones' backroom staff. Australian Jones, who has already appointed Steve Borthwick as forwards coach, worked with Gustard at Saracens. "This has been a difficult decision to make, but to coach England is an opportunity you just don't turn down," said Gustard. "To be given the chance with England is hugely humbling and I am thrilled to be involved." Saracens described Gustard's influence in his 10 years at the club as player and coach as "seismic" and said the introduction of his 'Wolfpack' defence would be a "lasting legacy". Jones gave Gustard his first coaching role in 2008-09. "I'm really pleased to have Paul join us as he is a quality coach who has done some fantastic things at Saracens," the 55-year-old said. "He has overseen Saracens' growth as a team, he has produced an aggressive defence system there and we are hoping he can do the same for England."